It’s the end of the year, which means that I’ve been doing the same thing as a lot of other people: reflecting on the last year and thinking forward to the year ahead. Since I have a blog now, and that basically means I publicly post my thoughts and reflections, I’m going to tell you what’s going through my mind these days. 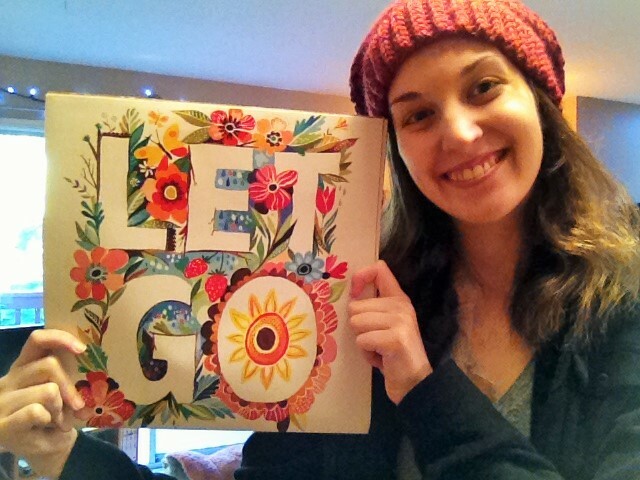 A year ago, at the end of 2013, I felt pretty defeated. 2013 was not an easy year for me. I started the year by taking some time off of school to get my health back on track. I naively thought that after a month of taking it easy I would be back to normal…and by normal I mean managing my gastroparesis with medication and diet while maintaining my weight, going to school, working and volunteering. Unfortunately, it didn’t work out like that and I actually spent 2013 getting sicker and sicker. I was unable to go back to school, I withdrew from dance classes, my relationship ended, and I ended up having to give up my job teaching dance. All because I was sick. I spent the month of October with a feeding tube up my nose and down my throat, followed by two months of desperately struggling to eat enough to avoid another feeding tube. I felt like I had lost what made me..me. Like I said, by the end of the year I was feeling defeated and I was ready to put the year behind me and move on. To add to that defeat, my desperate struggles to avoid another feeding tube hadn’t worked and the decision was made at the end of 2013 that I would have a feeding tube surgically placed in the new year. My nightmare of a year had ended, but the nightmare hadn’t. I was so hopeful that the feeding tube was going to be ‘the fix’ and turn things around for me! I was going to get back to school! Maybe by next Christmas I would have improved so much that I wouldn’t even have the feeding tube anymore! 2014 was going to be a happier and healthier year. So here I am now, at the end of 2014, reflecting back on the most challenging year of my life and not quite comprehending everything that has happened. Quick recap in no particular order: surgery, feeding tube, pain, granulation tissue, nausea, doubtful doctors, more nausea, burst balloons, weakness, exhaustion, hospitalizations, ER visits, TPN, appointment after appointment, missing Thanksgiving, missing Christmas, medication trials, X-rays up the wazoo, endless blood tests, sleepless nights and watching everyone else move on with their lives while I’m stuck in bed. And I’m not heading into 2015 healthy. I’m dealing with a lot of new and debilitating symptoms and waiting for several appointments with specialists who can hopefully get to the bottom of said symptoms. It was not the healthier year I hoped for. But isn’t health about so much more than just the body we live in? A year ago I felt defeated, discouraged and lost. I felt like I had no identity and all I could focus on were the things I couldn’t do anymore…work, go to school, live on my own, etc. I was scared, dreading getting a tube and everything that it would entail. I was hopeful that 2014 would be a better year, but my hope was rooted in desperation; I needed it to be a better year because I didn’t think I could handle anything else. One year later, I may be physically sicker but I am also happier. My identity is no longer defined by the things I can or cannot do; it’s defined by who I am as a person. 2014 was incredibly challenging but those challenges were what made this year one of personal growth and that growth is what helped me rediscover who I am. There are even more things this year that I am unable to do, and while that still gets me down when I think about it, I spend more time focusing on the things that I can do. I cannot go to school but I am still learning new things every day and using that knowledge to advocate for a better future for myself. I cannot make spontaneous plans with friends and do too many things in the real world with them, but I can connect with people all over the world facing similar struggles. I cannot enjoy food without consequences or eat enough to sustain myself, but I can safely care for my central line and handle all my TPN on my own, allowing me to enjoy the comfort of my own home. I am hopeful, once again, that 2015 will be a better year, but my hope now comes from a place of peace. I know it will be a better year, because I know that ‘better’ is not just determined by my physical health. All of my struggles this past year have made me a better person, just as all of my struggles in the new year will do the same. All of my struggles this past year have allowed me to connect with some truly wonderful people, and next year I’m sure I will meet even more. Of course I hope for improved physical health, but I know I will be able to face whatever comes my way. It won’t always be easy, and I won’t always have it all together, but I will be okay. 2014 taught me that. So maybe my body isn’t healthier, but my spirit is. I’m going to take some advice from my new calender and let go. At least I’m going to try. I’m going to try and let go of the doubt, the fear, the pain, the isolation, the frustration, and all of the other baggage from the last year (except of course for my feeding tube and TPN backpacks…that literal baggage is coming with me!). There’s no need to lug all that around. Besides, I need to make room for everything I am going to carry with me: the joy, the hope, the humour, the courage, the determination, the patience, the understanding, the strength and everything else 2014 gifted me with. All of that I’ll keep, because all of that will make the baggage 2015 is sure to bring a little easier to handle. This was the hardest and most challenging year of my life. But it wasn’t the worst. And next year? Next year will be better. Wishing you all a new year full of whatever you need it to bring! It is devastating to feel the loss of one’s sense of self – losing all the things that make you “you” as you so eloquently explained. It happened to me too – as a busy person whose pastimes entailed active pursuits I suddenly found myself unable to do them. It became a matter of doing exactly what you have been doing during the past 14 months or so – getting in touch with who you are as a person (and not as an expression of what you can and can’t do) and reinventing yourself, your lifestyle etc. by finding and focussing on things you CAN do. For me, it led to a new passion in life (crochet) and a new way to express myself. Sometimes you don’t have to relinquish all your interests but find new ways in which to experience and express them. For those total losses, acknowledge the grief – although you seem to already be doing that, letting it go. It is part of what you have described as “making room for the things that you are going to carry with you”. These are huge leaps and bounds and you can feel proud that you have achieved so much. I sincerely hope that 2015 will bring answers and a turn for the better for you. Such a lively spirit as yours surely deserves that. 2015 has already brought me some answers, so that’s good! Hopefully soon those answers will be followed up with improved health and quality of life, too. And thank goodness for crochet!! What would we do without it? Letting go and focusing on what you can do are two amazing mindset shifts are only two things that have kept me going. Our breakthroughs will happen. We are not our illness. Keep that spirit strong and never give up! whatever you need it to bring!